The museum of prehistory Urgeschichtemuseum (MAMUZ) in Asparn an der Zaya looks back on a long tradition, starting in the late 1960s, when the province of Lower Austria’s prehistoric collection found a new home at the freshly renovated palace Schloss Asparn. While the palace was being set up as a presentation area for the collection items the adjoining green area to the north of the palace was also being used for museum purposes. From the offset it was important for the museum management to not only create interest for professional circles and observers connected with the academic world by exhibiting collections of objects, but also to show prehistoric settlement habits in the form of reconstructions. The construction of the new longhouse showed that a large building of this kind must have been a major challenge for the people of the Linear Pottery culture and required careful planning. Just the preparation of the timbers, the roof material, the production of the tools and the creation of the fastening materials required a great deal of time. 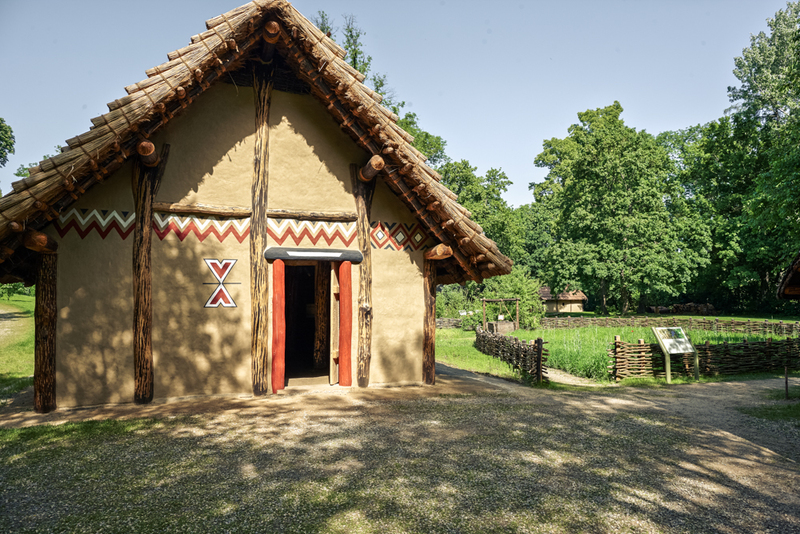 As a result from 1970 not only were the prehistoric collection items presented in the palace building, but an area of almost two hectares was designed for reconstructions of prehistoric huts and houses. 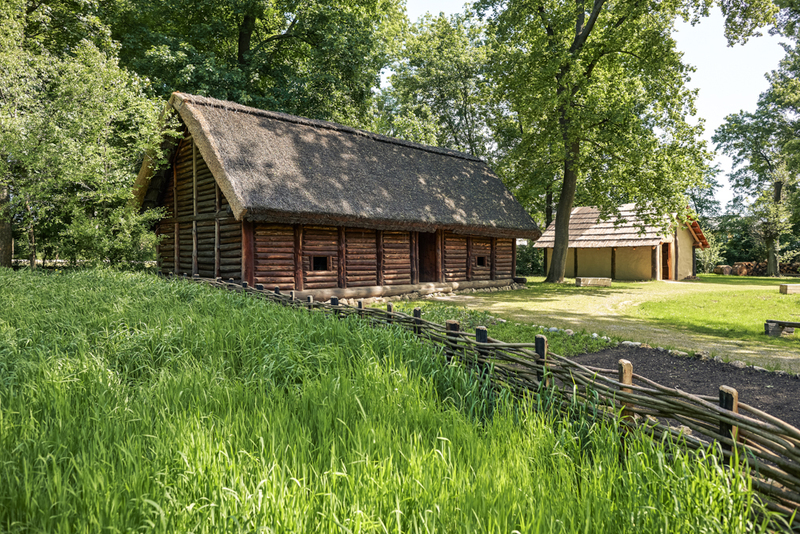 Over the decades, these former palace grounds have developed into an indispensable part of any exhibition visit to the Lower Austrian museum of prehistory Urgeschichtemuseum Niederösterreich. The historical core areas developed more and more and needed to be displayed at the open-air site:a circular path heads past reproductions of residential, farming and trade buildings from the Palaeolithic Age up to the Celts, making it possible to visualise the lifestyles and living conditions in earlier eras of Central Europe and also enabling visitors to understand and get a feeling - in the truest sense - of how people lived back then. Reproductions and models of historical buildings in archaeological parks largely fulfil the mission of a modern tourist destination:to make the historical activities understandable for a larger circle of interested people - not only for academics - and to explain these activities in a vivid manner. One special feature of MAMUZ is its focus on experimental archaeology. The reconstruction and description of the occurrence of archaeological records and finds is one of the key ways of working in archaeological research worldwide. The significance throughout Europe of the museum of prehistory in Asparn/Zaya in the area of experimental research means it is still possible today for courses to be held annually at the museum for students specialising in this field. 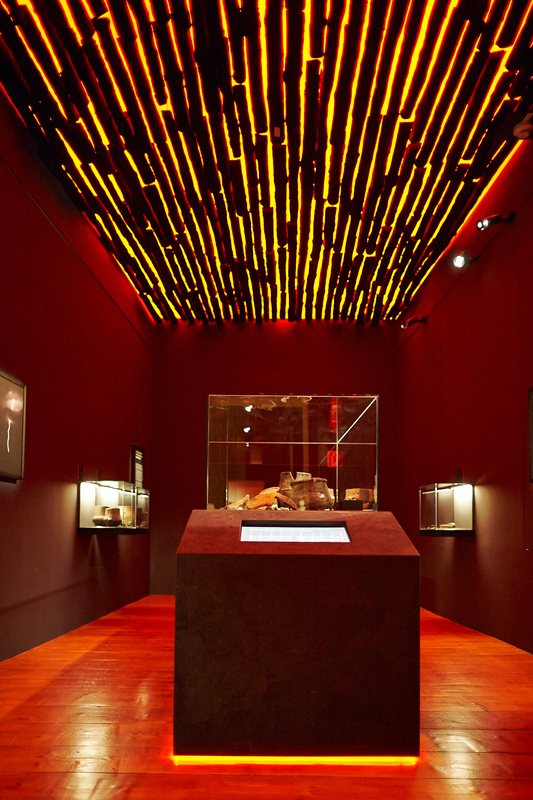 In spring 2012, VIAS (Vienna Institute for Archaeological Science), an interdisciplinary research platform for archaeology at the University of Vienna, was commissioned with constructing a new Linear Pottery culture longhouse model at the museum of prehistory. 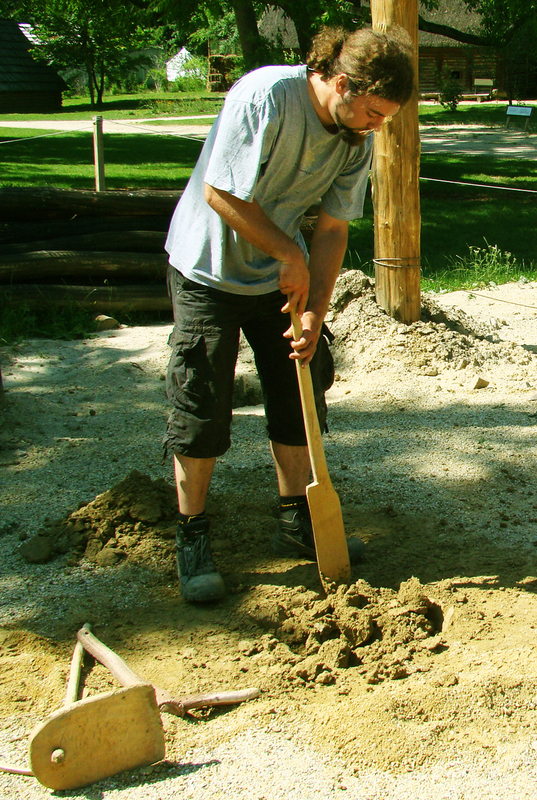 For more than 10 years, a working group for experimental archaeology at VIAS has been dealing with the practical construction of archaeological architectural models on the basis of excavation records. Used as an archaeological example was the excavation record of a Linear Pottery culture post construction from Schwechat, which was excavated by Franz Sauer in 2001 and was evaluated and published by Judith Schwarzäugl. The house ground plan was extraordinarily well preserved and had a length of 28.5 m and a width of 5.8 m. In some post pits there are still clear traces of the vertical timbers that indicate that round timbers had been installed here. Before the practical construction work, VIAS carried out extensive research on the status of Linear Pottery culture wood technology. From settlement and grave finds we know that sharpened stone blades and also tools made of bone were, in all probability, used for woodworking. Preserved building and construction timbers from this period have so far come solely from Linear Pottery culture well finds which indicate astonishingly highly developed wood technology. On the basis of the house grand plan from Schwechat with its individual construction features, a house model needed to be designed which did justice both to the knowledge of the tools from this period and also the wood joining techniques known from the wells. VIAS developed a model with posts, roof beams, tie beams, roof membrane supports and lath wood, for which there was a good argument based on the positions of the excavated posts. Here the experimental archaeologists also considered the question of how the people from the Linear Pottery culture might have created their house design on the construction site and came to the hypothesis that they might have used a building module measurement. It was attempted to derive one of these from the distances between the post positions in the ground plan from Schwechat, and a figure of 31.6 cm was calculated here. Under the premise that our building module measurement might have had a nominal value of one it was possible, by reproducing this figure, to mark the ground plan for the longhouse model at the construction site with the help of taut cords and wooden pegs so that the deviations from the original record from Schwechat were below one percent. During the construction work on a scale of 1:1 it was possible to carry out experimental archaeological tests with reconstructed tools made of stone, bone and wood to answer specific questions on the construction. 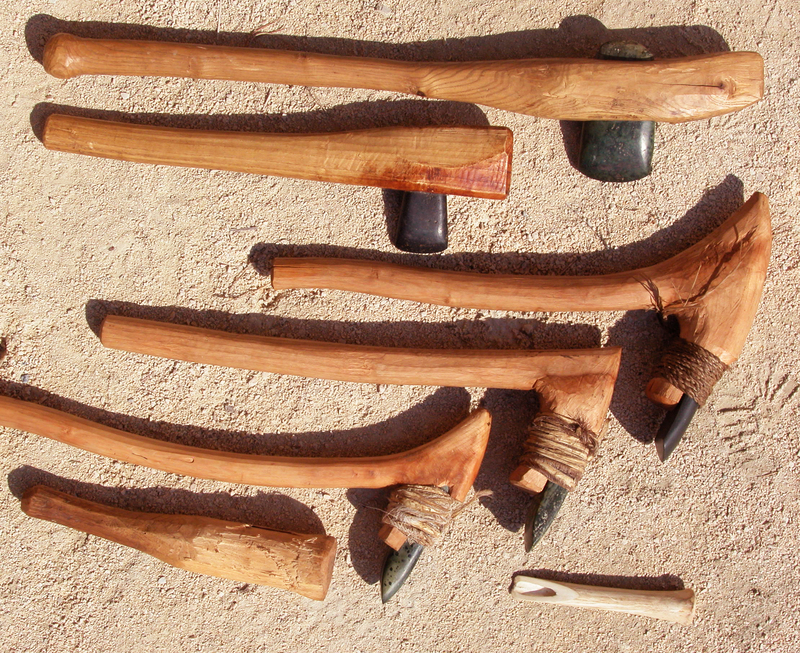 The first farmers had their own developed range of tools for woodworking, and here adze forms played a key role. They were able to clear primeval forests and also chop down trunks with diameters of more than 1 m, cut them and, if necessary, split them purposefully into timbers of all sizes. With narrow and high adzes they were able to shape many different construction timbers from the obtained pieces of wood, and with narrow and broad forms the surface of these could be finely smoothed. There were also so-called setting wedges with rather small mounting holes that were most likely used to systematically split horizontal timber. The known tool set also included chisels made of bone which were used to create notches and slits, bone awls for marking, and also flint blades for smoothing surfaces. Yardsticks might also have already been used for transferring distances. With practical experiments it became clear to the archaeologists that cords or ropes must have been indispensable, not only for tying but also as important tools which enabled the people to mark out straight rows or measure and transfer distances. In some work steps it seemed worthwhile for the experimental archaeologists at VIAS to work with a kind of ‘drawing floor’ to be able to precisely coordinate positions and lengths of timbers with each other in the sense of ‘field measurements’. 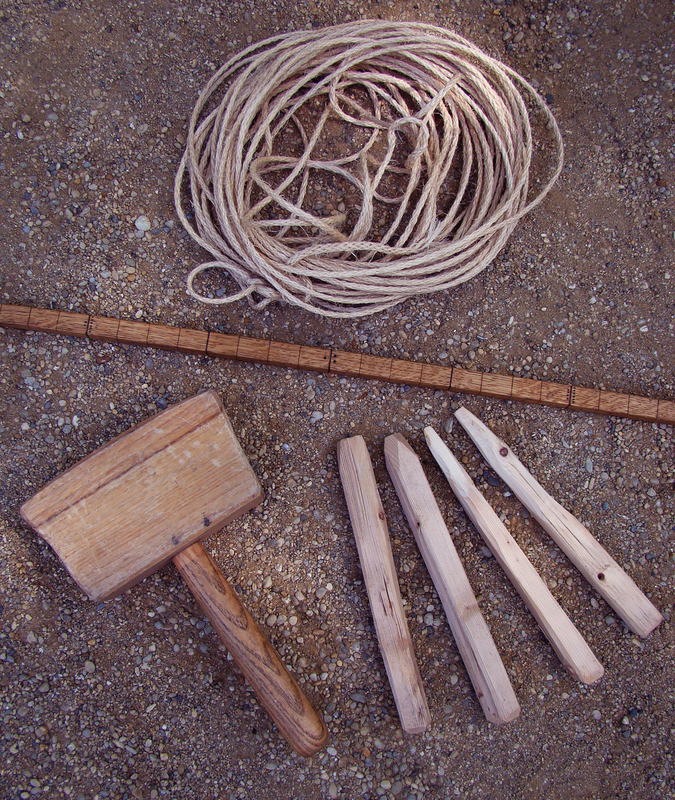 In terms of wood joints: blocks, mortise dowel joints, halvings and also birdsmouth joints were known; and some of these joining techniques were able to be secured by tree nails. The pin lock connection was also already known. From the well finds in particular it became clear that we must definitely not underestimate the wood technology skills of this cultural stage. But to what extent did the people of the Linear Pottery culture also use the developed wood technology known from the wells for house construction?In the light of the well finds, we might think of buildings whose construction timbers were given a flat finish on the other side. But the documented round post positions of the archaeological record from Schwechat indicate that longhouses were built from round trunks in particular. It must be assumed that the huge amount of work that would have been required to chop all wood parts into rectangles would have ultimately been too great even if this had been technically feasible. The construction of longhouses was also probably part of a passed down tradition that was evidently familiar with working with round trunks. But we can certainly imagine that some of the wood joint elements known from the wells, such as mortise and tenon joints and also tree nails, played a certain role in house construction too. There is also nothing to indicate that people did not also use split timbers occasionally here or were not able to work individual construction elements until flat if this made sense from a construction perspective. 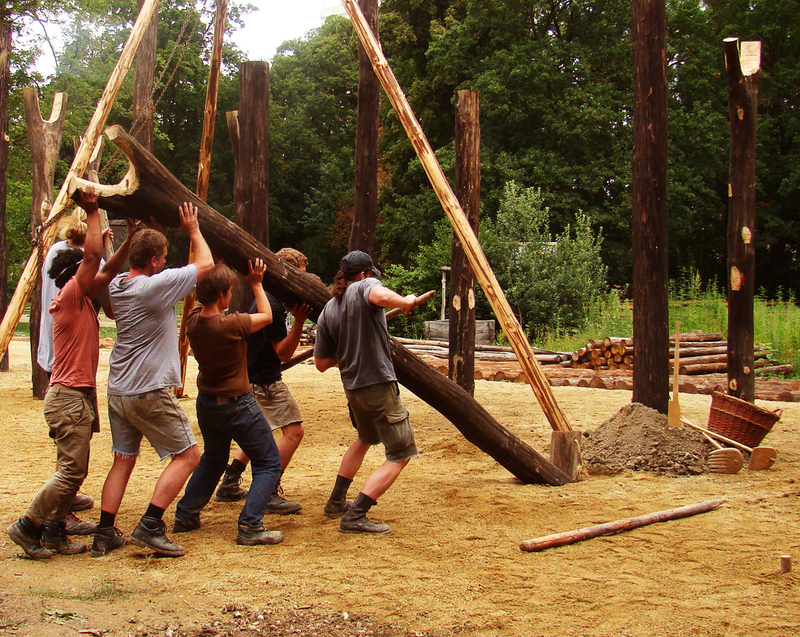 We may assume that naturally growing forms such as wishbone trees and bases of branches were also used as construction elements for building houses and that ‘wood joining”’ in the original sense - fitting together and securing individual construction elements using cords and ropes - played an extremely important role here. During the construction work, in 2012 the frame of the longhouse model was built, this was covered with a roof made of reeds, and the walls were also sealed with wattle and plastered with a combination of loess loam, sand and chopped straw. In the spring of 2013 the interior of the building was also structured with two partition walls, in the front area an intermediate ceiling for storing goods was added, and the door and window areas were designed. The work was completed by VIAS in mid-April 2013. Archaeological researchers assume that the three-part division of the interior of Linear Pottery culture houses, which can be seen in many house ground plans, reflects areas of different use. In the rear area, the walls were particularly sturdy thanks to posts being positioned directly next to each other. Maybe people slept in this particularly protected area or stored especially valuable goods there?This part of the building might also have had holy significance to some extent. In the middle section the distances between the load-bearing rows of transverse posts are the largest, meaning the biggest areas without posts would have been here. This middle section is usually interpreted as a central living and activity area that might also have been equipped with a cooking area and oven. The double post alignments of the front part of the house are seen as a substructure for an intermediate floor where people would have stored provisions for winter. The ground-level area might have been used as a work area here. In the new longhouse model in Asparn, the individual house areas have also been set up and - if justifiable from an archaeological perspective - equipped with a hearth furnace and oven, grinding stone, weaving loom, furniture and pottery and also with many other pieces of equipment and tools for daily use. We can very well imagine that the highly developed wood technology known from the wells manifested itself in particular in the design of door and window areas and also in the production of pieces of furniture, equipment and tools. There are many indications that there was often only one large, three-part building per settlement phase in early Neolithic settlements. This underlines the significance of these longhouses, which today are usually interpreted as residential and storage buildings for an extended family in each case. The construction of the new longhouse showed that a large building of this kind must have been a major challenge for the people of the Linear Pottery culture and required careful planning. Just the preparation of the timbers, the roof material, the production of the tools and the creation of the fastening materials required a great deal of time. It seems probable that the construction of a new longhouse was prepared and realised over several years. Here members of all age groups of Neolithic society might have cooperated in different work steps. The practical experiments VIAS has carried out with recreated Linear Pottery culture tools made of stone, bone and wood have shown that it must have been best for the people to work timber very soon after cutting down trees so that the tools were not put at risk. For this reason we can deduce that people cut the necessary timbers in small quantities from several tree trunks in each case, transported these to the construction site and then gradually worked them. It is in the nature of things that the interpretative character of an archaeological house model necessarily increases with every centimetre that we move away from the archaeologically verifiable facts of the floor area. Looking at it this way, the longhouse model in MAMUZ in Asparn is only one of several possible implementations. There are also alternative interpretative approaches for some construction details. But we can claim in good faith that we can justify every single construction detail of the new house model in Asparn in the light of the archaeologically known facts. 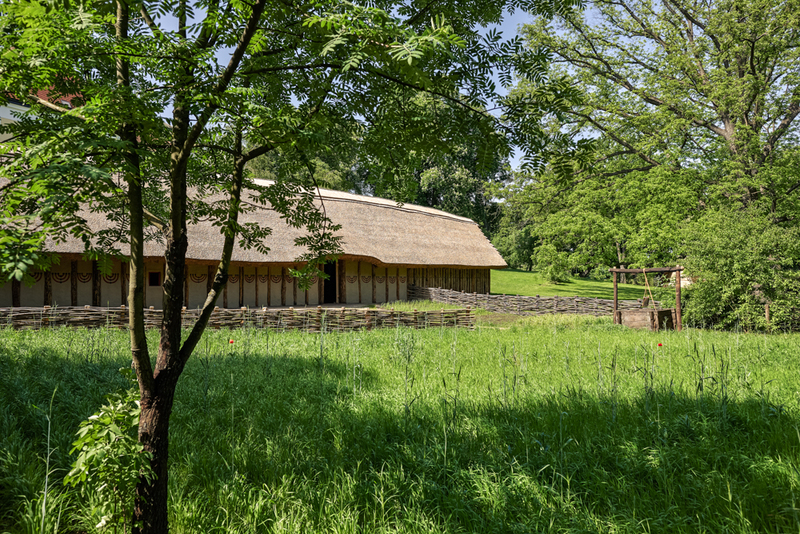 The recreation of a Neolithic longhouse based on experimental archaeological methods represents only one part of the model constructions of prehistoric residential, farming and trade buildings already existing in the museum of prehistory in Asparn. In recent years there has been a gradual shift away from the previous policy of often loosely grouping together various buildings. This shift has been brought about by creating a circular tour with new signposted pathways for visitors to go through entire village landscapes. The archaeological open-air site needed to be redesigned so that the focus was not on individual objects from the respective periods in the history of the human race, but rather on small village communities that give a better reflection of prehistoric life. Particular attention was therefore paid to landscape planning and landscape management. The functional and creative landscape architecture represents a key element for making the archaeological open-air site at the museum of prehistory attractive for visitors. The design was not conceived as a ‘park’ but rather as a ‘cultivated wilderness’ that visitors can actively experience and which primarily uses cultivated plants from ancient history. 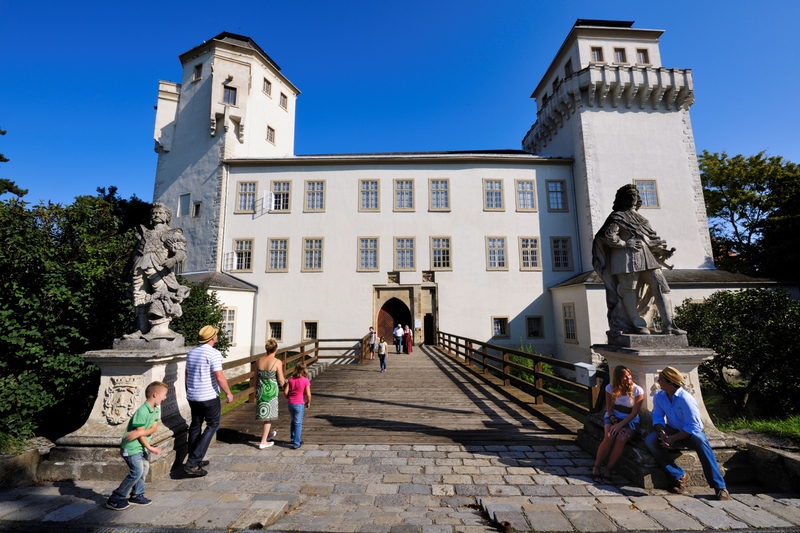 In April 2014 the two locations MAMUZ Schloss Asparn/Zaya and MAMUZ Museum Mistelbach (as a place for special exhibitions and conferences) opened together as a centre - which is unique in Lower Austria - covering 40,000 years of the history of the human race. Thismuseum is therefore the only one in Lower Austria in which the province’s history from the Palaeolithic Age around 40,000 years ago up to the High Middle Ages is presented in a clear and vivid manner. As well as the extensive presentation of the collection of the province of Lower Austria, the focus is on experience-oriented and didactically designed special exhibitions. 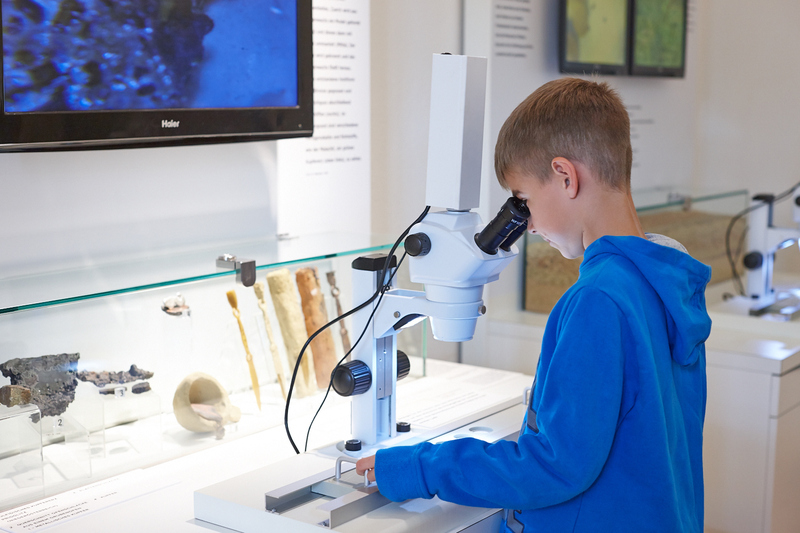 To give visitors an insight into the everyday work of academics, a researchers’ laboratory has been set up in the west wing of the ground floor. 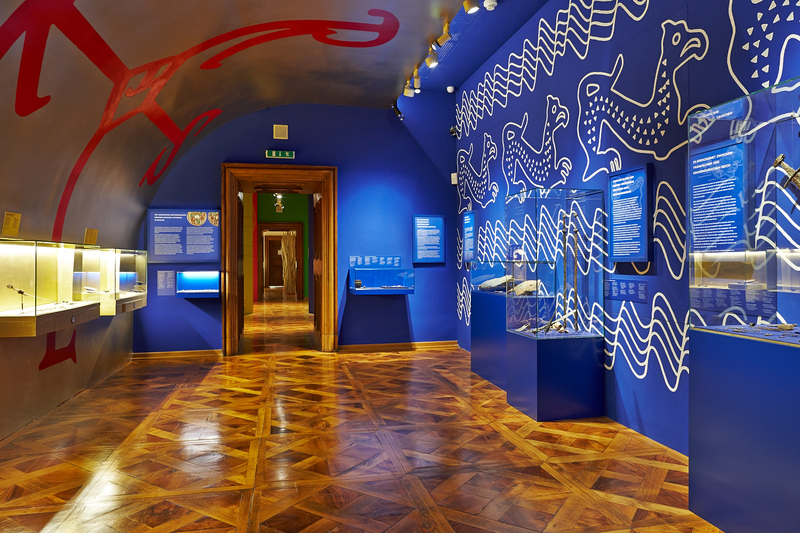 In an area of around 120 m2, three rooms provide interesting information on the theme of archaeology. 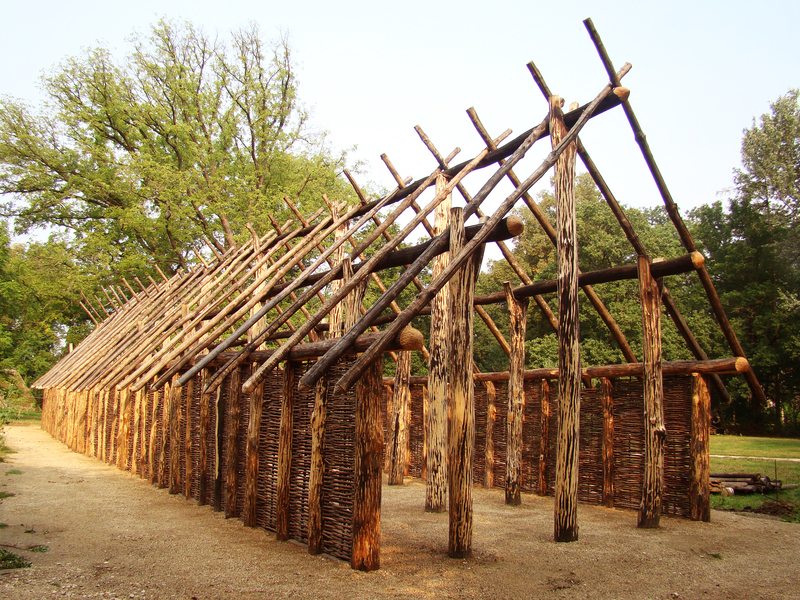 In conjunction with the permanent exhibition and the special exhibitions on central themes of the province of Lower Austria’s archaeology, the archaeological open-air site at MAMUZ - with its reconstructions of prehistoric buildings from the Stone Age to the Iron Age - is a major attraction for visitors. 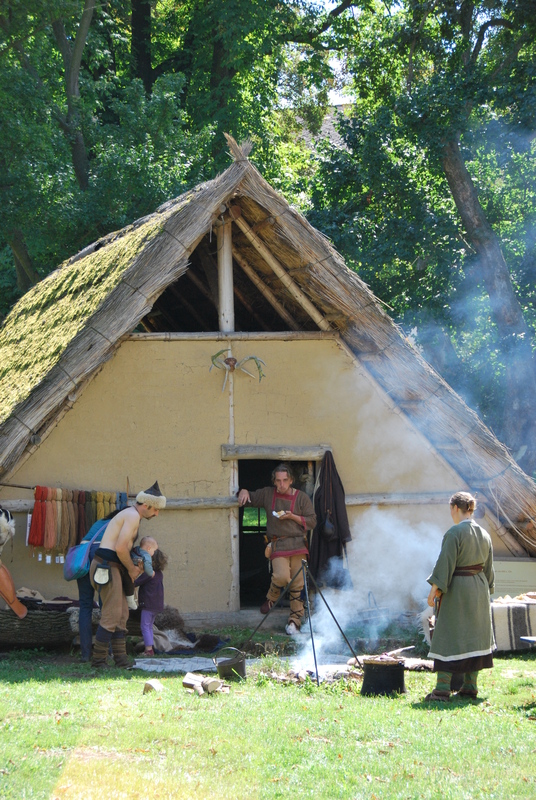 The museum is aiming to establish itself at different locations and also as a centre of research and knowledge with a focus on experimental archaeology with an international outlook. MAMUZ aims to show how strategic cooperation between the two apparently contrary - but actually closely connected - areas of archaeology and tourism can lead to effective academic and also economic cooperation.